Great efforts can make a franchise business grow a lot! So it's important to take your expansion of the business serious right from the start. 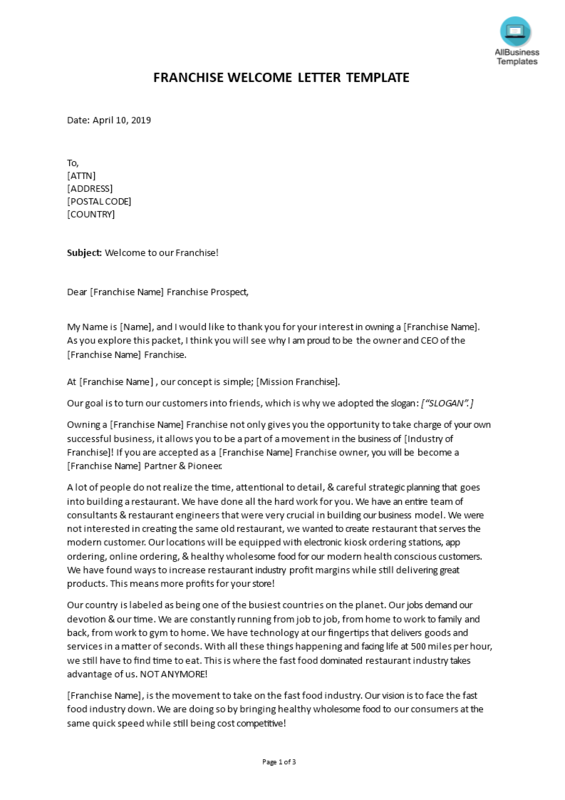 Certainly, have a look at this Franchise Welcome Letter, which will capture your future partners and audience's attention. If you need a great sales letter and you can’t do it on your own you should use letter templates. For those who own a franchise, they know it is important to communicate in a professional way in order to grow the business faster! Content: At [Franchise Name] , our concept is simple; [Mission Franchise]. Owning a [Franchise Name] Franchise not only gives you the opportunity to take charge of your own successful business, it allows you to be a part of a movement in the business of [Industry of Franchise]! If you are accepted as a [Franchise Name] Franchise owner, you will become a [Franchise Name] Partner & Pioneer. After downloading and filling in the blanks, you can easily customize e.g. visuals, typography, details, and appearance of your Franchise Welcome Letter. Download this Sales template now!